Dive to through the depths of the ocean to explore what lies beneath the watery surface. Click here to play! If you can successfully uncover the mysteries of the deep, you'll find yourself bringing in a pretty handsome fortune! To get you started on your watery adventure, you'll want to spin the dive helmet. This symbol only appears on selected reels, but will substitute for all other symbols (excluding scatters) to help you bring in more wins. If you can spin three or more, you'll trigger a free game feature. You'll definitely see plenty of interesting creatures while you're searching the sea floor. Spin two to five crabs and you'll get up to 10000 times your line bet. Two to five boats will get you up to 2500 times your line bet. There are also starfish, fish, A, K, Q, J, 10 and 9 symbols to help you bring in your fortune. You'll want to keep a close eye out for the giant clam while you're underwater. This illusive creature acts as a scatter and will multiply your total bet up to 100 times. Are you brave enough to search the ocean floor? 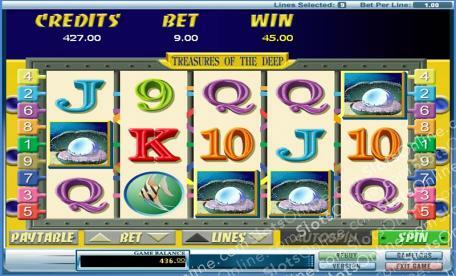 Spin the reels in this underwater adventure for a chance at a sizeable fortune! The giant clam acts as a scatter. Spin two to five of this symbol anywhere on the board and you will get 1, 5, 10, 100 times your total bet respectively. The diving helmet also acts as a scatter, awarding a number of free spins if you spin it across reels 2, 3 and 4. During free spins all prizes are doubled. The dive helmet acts as a substitute. It only appears on reels 2, 3 and 4 but will replace all other symbols (excluding scatters) to help you create more wins. Three or more will trigger a bonus feature.